Unlike for the Maelstrom line, there are no standard options for Trident line scabbards. Prices shown here are approximate. Trident line wooden cores are wool-lined and feature historically-accurate cross-sections and distal tapers. Hand Dyed leather provides a completely different look and feel from the machine dyed equivalent. in general hand dyed leather has color contrasts which makes the pieces look more period authentic. An example of a historically-accurate belt and suspension system. You can select any buckle from the buckle list. Buckle prices vary based on model. Wire decoration helps delineate your scabbard. Wire decoration was often used in period for decorative work on sword pommels and hilts. This is an example of the sort of work we typically do with twisted wire. Add any metal decorative element from the decorative elements list. If you don't see something from the theme you want, ask us about it. We can find just about anything. Add braided leather work as a decorative touch or as part of your suspension system. 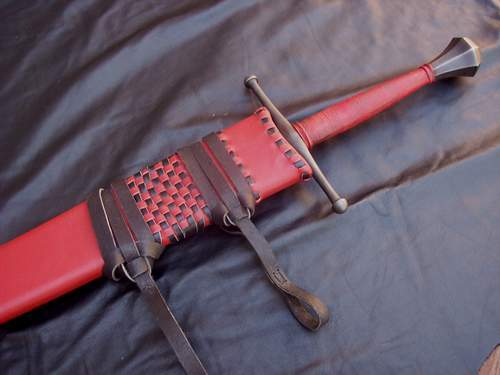 Here in one of my earlier efforts I used braided leather in the suspension system for a Del Tin Falchion. Add a chape and locket, ranging from simple to elaborate, like the chape shown here. Trident line chapes are cast from historical originals and are some of the best reproductions currently on the market. Add a triangle flap at the top of your scabbard. This was often done in period. Hand stitching is a time-consuming process but is another one of those details that make your scabbard that much more historically accurate. 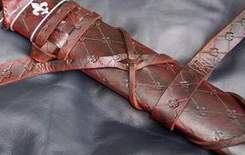 Leather Tooling was one of the most common ways to decorate sheaths and scabbards (and indeed most leatherwork) in period. At Tritonworks we are able to provide a multitude of off the shelf stamping options and even custom stamps should you so desire. Rain guards are often pictured in period artwork, especially in the 15th and 16th centuries. It is questionable as to whether or not rain guards were more functional or more decorative but we can build you a custom rainguard which is both functional and decorative and integrate it into the existing grip of your sword. The rainguard will be custom tooled to your specification. Tritonworks Trident Line scabbards are intended to be matched to the desire of the customer. 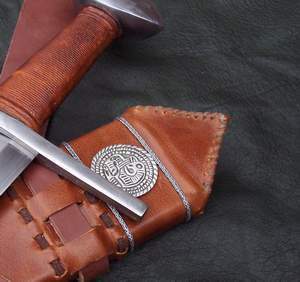 If you want your scabbard to be that of a Venetian bravo, a Germanic mercenary, an English knight, or any other nationality of any station at any time period, we will do our utmost to accommodate you. This customer wanted something special for his Albion Baron, something that paid tribute to his grandmother, the rose motif matches her headstone. This one is an Armour Class baskethilt. Although something of an anachronism that celtic knot pays tribute to the celtic roots of the owner. This particular project owes its inspiration to two different archeological findes, the baldric and scabbard to the Lyon burial, the belt to a tomb carving in Italy. This particular sax was patterned after one from the Netherlands, the "Heerewaarden seax." This sword started out life as a standard Albion yeoman but Albion customized it for the customer with a steel cross and a bronze pommel sporting a steel Star of David. In keeping with this them we have embossed hebrew text on the scabbard and stamped tiny Stars of David on the belt. This is the first bronze age sword that we have done in many years. It was fun to revisit that era. This is our latest khukri scabbard. We don't do a lot of these but they are interesting pieces to do. Here we have what is commonly termed a "cut and thrust" transitional sword. Full length shot of sword in scabbard with hanger. This scabbard was an experiment in new hand stamping and hand dying techniques. This is a scabbard for the Armart Urnfield Sword. 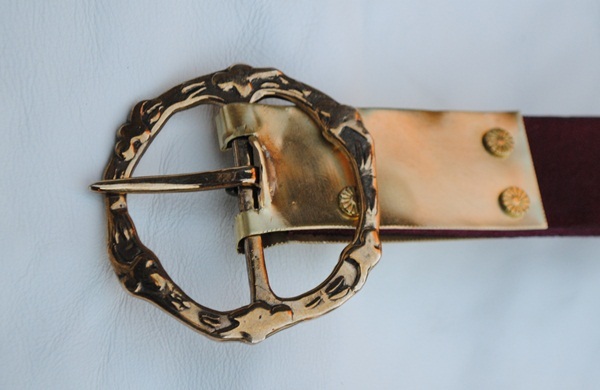 This particular scabbard features a goatskin outer with cast bronze fittings. Full length shot of DT 5161 sheathed notice the risers under the leather. This is a scabbard for the Albion Reeve, the customer in this case wanted something a little different. 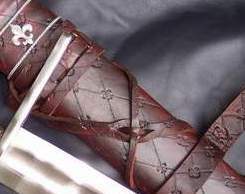 A complicated Viking Style suspension system is the highlight of this Jarl scabbard. This scabbard features custom embossing, and copper inlay along with copper hardware all with a crescent theme. The customer designed this scabbard to reflect the wish of Henry V to go on a crusade to the Holy Land. This scabbard and suspension are based on the Ballatearae Icelandic archeological finds. The the shoulder pad was not found on the original and is a customer request. It is fully removeable. Scabbard for an antique smallsword. The scabbard hardware was made by another vendor and I built the scabbard to match both the hardware on the exterior and the sword on the interior. Full-length shot of a Del Tin 14th century sword. 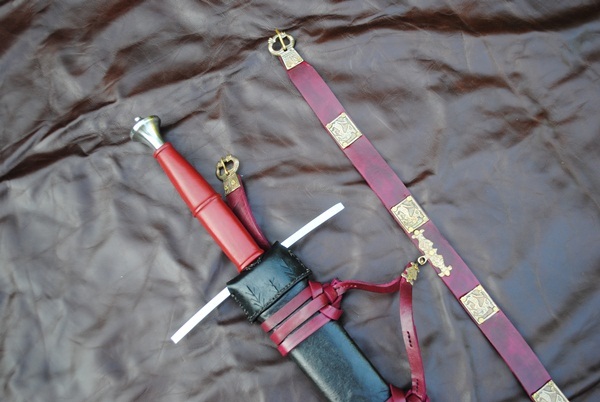 The scabbard is distressed red leather the belt is distressed brown leather. This scabbard for an Albion Decurio is inspired by the 3rd century Lyon burial which featured a similar sword. This is a scabbard I did up for an Albion Allectus. The scabbard is accurate however the balteus (belt) has been simplified as a cost saving measure for this customer. 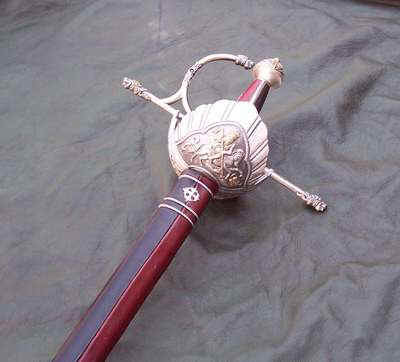 Fancy rapier with two tone scabbard. Note the contrasting colors to match the rapier handle. A detail of the work on the throat of this scabbard. Note the black and read weave. A full length shot of the sword sheathed. Note the sheathed by knives in the exterior sheaths. © Copyright 2017, Tritonworks Custom Scabbards. All rights reserved. Site design by Pilgrim Web Design.